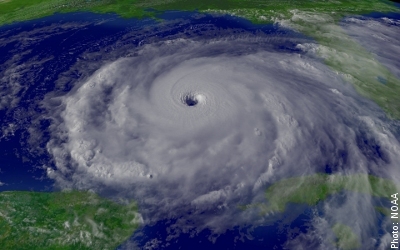 Hurricane Rita at its peak in the Gulf of Mexico in September 2005. Hurricanes, tropical cyclones and typhoons are high-speed, spiraling storms with winds that reach a constant speed of 119 km/h (74 mph). The storms which originate in the Atlantic Ocean are called hurricanes. The ones that reach the United States and Europe usually start off the coast of Africa. The air currents there move westward and they take the hurricanes with them. In the South Pacific and the Indian Ocean, these storms are called tropical cyclones. Typhoon is the name given to this phenomenon in the North Pacific. Because the Earth is round, sunlight is less concentrated toward the poles. The red and blue spans contain the same amount of sunlight, but the blue span is spread over a larger area of the Earth's surface. With seasonal changes come changes in temperature. These changes mostly come from the shape, tilt, and movement of the Earth. 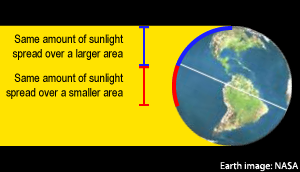 Because the Earth is round, parts of the Earth closer to the Equator face the Sun more directly, while parts closer to the North and South Poles are angled away from the Sun. Sunlight and heat are concentrated on the parts of the Earth angled toward the sun, because the light and heat are spread over a smaller surface area. The strip of the Earth's surface that most directly faces the Sun isn't always exactly the Equator; it changes as the Earth orbits the Sun because the Earth's axis is tilted. As summer approaches, (May in the Northern Hemisphere and November in the Southern Hemisphere), the tilt of the Earth shifts the concentration of the Sun’s rays away from the Equator. In the Northern Hemisphere, the concentration of sunlight moves northward toward the Tropic of Cancer, warming the ocean waters on the way. Ocean water must be at least 60 m (200 ft) deep for a tropical storm to occur. Then in July and August, the concentration of the Sun’s rays moves southward back toward the Equator, continuing to warm the already warmed water. Very warm water, at least 27°C (80°F), is a necessary ingredient for the creation of a tropical storm. The concentration of sunlight continues to move southward to the Tropic of Capricorn as summer nears in the Southern Hemisphere. The same process of warming the ocean water then occurs there, explaining the difference in the storm seasons for the two hemispheres. The physical processes that power a hurricane. Due to evaporation and convection, the air above the ocean water becomes warm and moist. This air is pushed up by the surrounding colder denser air as it sinks. This causes wind. The Earth’s rotation causes the wind to begin to swirl as it rises. 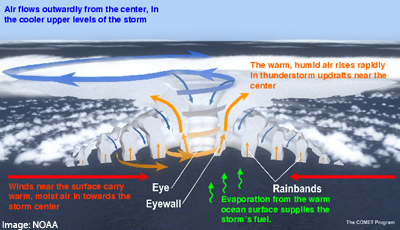 As the warm moist air rises, it becomes denser as it cools and begins to sink into the center of the storm. This center will become the eye of the hurricane if the storm progresses to that stage. The air continues to rise and sink as it spirals. In the Atlantic Ocean, above the Equator, there are typically one hundred storms during hurricane season that begin this way. Roughly 10% of these storms become tropical storms and only 6% produce winds that are strong enough to be classified as hurricanes. The strongest winds are in the eye wall, the area surrounding the eye. The winds spin counterclockwise in the Northern Hemisphere and clockwise in the Southern Hemisphere. Hurricanes/tropical cyclones cause torrential rain. As a tropical storm approaches land, it also pushes a wall of water called a storm surge onto the shore. 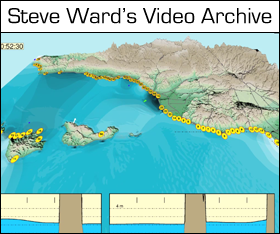 Flooding results, which can go inland for several miles. Once the storm reaches land, or even colder water, the storm dies out. It needs to be over warm water to survive. In 1972, American scientists Herbert Saffir and Robert Simpson developed the Saffir-Simpson Scale to classify the severity of hurricanes. This scale ranks hurricanes by the intensity of wind speeds. Hurricanes are divided into five categories. Storms are classified by their wind speed. Once the speed reaches 63 km/h (39 mph), the weather condition is called a tropical storm and is given a name. This process begins the warning system. If the wind speed reaches 119 km/h (74 mph), the storm is reclassified as a hurricane. As part of this hurricane/tropical storm tracking system, the World Meteorological Organization (located in Geneva, Switzerland) maintains the lists of these names for all tropical storms. In each region of the world, names for those lists are chosen based on regional preference and are rotated each year. Tropical cyclones can be given men’s or women’s names, as well as names of animals and flowers. Lists of names for Atlantic hurricanes are alternating men and women’s names in alphabetical order. The names of the some of the worst tropical storms have been retired and will never be used again. If a name is retired in one of the lists of Atlantic hurricane names, it is replaced with a name that begins with the same letter. As technology and research techniques have advanced over the years, meteorologists have been able to be more accurate in spotting potential tropical storms. In the early days of forecasting, scientists relied on “storm spotters,” people in a position to report weather conditions that could result in tropical storms. These would include sailors and residents of coastal regions. Weather conditions “spotted” would include the type of clouds and the amount of steady rain, as well as the force of the wind. Later, airplane pilots were included as spotters. During the 1940’s, specially equipped aircraft began flying into storms and reporting the conditions. In 1960, meteorologists started using weather satellites. This was a major advancement, giving scientists the ability to forecast tropical storms and hurricanes before they touched land. Also during the 1960’s, the advances in radar capabilities increased the accuracy of hurricanes forecasts. Doppler weather radar was added in the late 1980’s. Scientists also use a host of surface stations to measure wind speed as the hurricane touches land. If these stations are damaged by the winds, the structural damage of buildings and boats and the distribution of debris aid in the estimation of wind speed. Meteorologists continue to reanalyze data from past hurricanes as newer techniques and technologies come into play. This process increases the scientists’ ability to develop reliable hurricane models and to accurately forecast hurricanes.